Plantas rum & maple in a no name cutty. Saw these orange pouches everywhere last time I was working in Germany. Trying it for the first & last time tonight. A classic & genuine aromatic, no tobacco taste whatsoever. Although to be fair it's more 'cheap & cheerful' than 'cheap & nasty'. Would be an enjoyable smoke for beginners & aromatic lovers. Last night it was woman's champions league games on, I Passed on it!!!!!!!!! I know what you mean ally, it's not the best. Although I'm not generally interested in women's sports, I'm a huge fan of ladies hockey! Unfortunately, it's not on the telly tonight either. I say, that's a big ole bowl of Revor! How long did that smoke last? A definate 'pipe for the parlour' & no mistake. Amazing to think old queen Victoria was still on the throne when that pipe was first being smoked. I sliced enough for more than one bowl and returned the rest to the canning jar. So about 2/3 of what you saw sliced went into the bowl and even then it wasn't full. That bowl took about an hour or 90 min to smoke. It worked fine until I got near the bottom of the bowl and then there was some damp/soggy leaves that didn't want to burn. SInce the bowl had been totally reamed and cleaned with EtOH by a previous owner, I simply stopped smoking it and discarded the remainder. On unscrewing the bottom cover, there were some droplets of moisture accumulated there. The pipe cleaners stayed relatively clean everywhere except in the draughthole into the bowl. The pipe stayed quite cool while smoking and the Revor tasted quite mild. A surprisingly good smoke for such a large bowl. A mid-evening smoke; Blue Capstan in a Winsløw 'Hand Made in Denmark'. Vintage St. Bruno flake in a northern briars. For us Brits here, there's a great version of the 'hound of the baskervilles' starting soon. 9pm on drama, it's the fairly recent one with Richard Roxburgh & Ian Hart. Good morning everybody. After another spell of winter, spring definitely seems to have arrived. I enjoyed riding the motorcycle on country roads to the BMW workshop in Northampton yesterday. They replaced the broken control unit for bluetooth communication with the Garmin SatNav on the motorcycle for the cost of parts, and I could finally hear instructions again on the subsequent trip to work. And it didn‘t even freeze overnight and the sky is blue. I finally decided. The 1900 BBB cavalier is to be inaugurated with Revor. Death to all aromatic ghosts!!!!! Out with the plug cutter and the Revor. Let it dry all of 10 minutes while I make some tee, studentsff the pipe and light it. A few things: 1) Best pic ever. 2) Straight burley ain't got nuthin' on Revor as a ghostbuster. 3) Yeah, 10 minutes is all it needs, regardless of how damp it feels. It really is one of the best burning 'baccies I've ever smoked. 4) I know that plug slicer is best utilized on neutron-dense plugs like Yachtsman and 3Ps, but it's so awesome why the hell not use it, I say, on everything with "plug" in its name, even softer stuff like Revor. McConells Scottish cake in a golden arrow pot. Maltan Ready Rubbed in a Stanwell Dublin Featherweight. Hawky, if you're watching, I now get the HU Sissinghurst comparison, not just the tin note but also for the first few minutes of the smoke. The kiddos and I "nuked" the kitchen and the last task was to clean the oven. This time they walked over to the oven and pushed two buttons. Who knew it was self cleaning? The last of a tin of DDNR in an Ardor. There is a certain sadness now when one finishes a tin of Dunhill. Good Evening, Gentlemen! The sun is shining, the sky is clearing, and it's just warm enough to have one of the workshop doors open while I have my blanket over me while my feet are up in the pipe smoking position. The precious wife came home with a carload of groceries and I'm worn out from hauling everything in! Now smoking a bowl of DF in the Stanwell "29" smooth billiard, an excellent flake smoker, with a last mugga joe on the side. 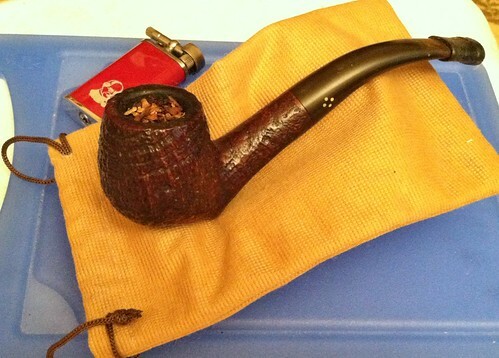 Edit: Finishing up the day with a bowl of Haunted Bookshop in the Rockbass Stanwell "Nordic" blasted apple. Last edited by coalsmoke; 03-22-2018 at 22:37. MacBaren HH Vintage Syrian in the Sasieni Four Dot Ruff-Root Burton.